There is something very comforting about an upside down cake. It’s old school baking, which I think is the best kind of baking. Think chocolate chip cookies and bundt cakes. I saw this recipe while flipping through the October 2006 issue of Martha Stewart Living. The picture made me want to eat it immediately. When I read the recipe it confirmed what my eyes already told me. The addition of saffron and ginger give the cake a modern twist, but the caramelized pears give it a classic upside down flavour. Preheat oven to 350 degrees. Coat an 8-inch square or round cake pan with cooking spray. Line bottom with parchment paper, and set aside. In a food processor, pulse the saffron and 1/4 cup sugar. In a bowl beat the sugar mixture with the butter until light and fluffy. Spread the mixture in the pan. Place the pear slices over the butter in a decorative pattern. Whisk the dry ingredients together. In another bowl, whisk the wet ingredients together. Add the wet ingredients to the dry in a slow stream while stirring. Spread the batter over the pears. Bake for 40 to 45 minutes, until a tester comes out clean. Let cool for 5 minutes then flip onto a serving platter and allow to cool completely. I’ve never made an upside down cake. This looks perfectly elegant and delicious! That upside down cake looks wonderful! 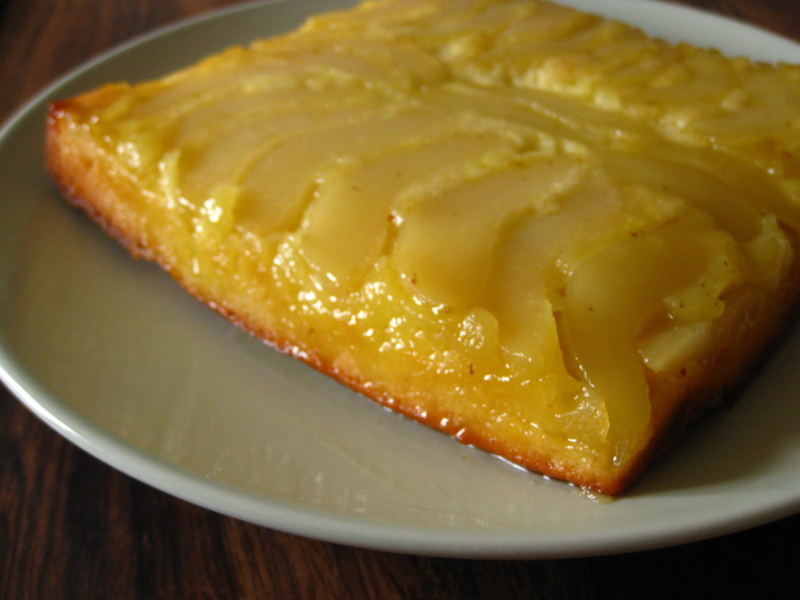 I’ve never made one with pears before…awesome idea! Wow, wonderful… and also intriguing. I’ve never heard of saffron in a cake before. That sounds so interesting! Wow, this cake is beautiful and looks delicious! Mmm, it certainly sounds delicious. There should be something known as “comfort baking”, the sort of old school baking you’re talking about! Looks great! But I have a ridiculous question. What does saffron taste like? I’m not sure I know what it tastes like….. The pears, the saffron, the spices – it draws me in. It sings sweetly of autumn. I made once an apple upside down cake and it was delicious. I bet this one is as tasty as it looks! This is so pretty!, I’ve never had the best of luck when it comes to doing up side down tarts, or cakes… yours look so lovely! amazing. I just about melted when I saw that picture. You’ve actually made me want to eat pears … and I don’t like pears. This is beautiful! Pingback: Cream Puffs In Venice - Magazine Mondays: Bulgur! Wow, this cake looks beautiful – I love the idea of the saffron and ginger in here.